Chicago’s voters will choose a new mayor for the first time in over 20 years this coming week. I found surveys online that puts each candidate’s ideas about education in their own words. If you live here, you probably don't need my maps to tell you that Chicago is dealing with a crisis of poor school/student performance. In fact, I can't personally remember the last time I saw a news story that framed Chicago's public schools in a light that didn't include failing, closing, mismanagement or crime. Against this backdrop, I have written a lot of articles for Mapping For Justice that supplement the ongoing negative news with stories of hope, showing cases where tutor/mentor programs are helping some of these communities, and advocating for leadership to build tutor/mentor support in areas where our kids need as much help as possible. I have also come to believe, based on my research, that poorly-prepared students become poorly-prepared adults and eventually becomes a taxpayer burden for everyone. 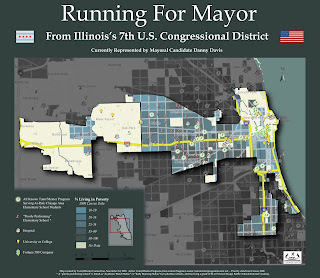 For this reason, I feel this is an issue voters should not ignore when choosing Chicago's next leader. 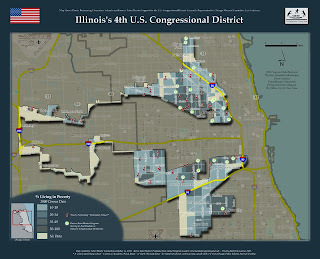 Recently, Cabrini Connections program leader Dan Bassill wrote, "I wish voters in Chicago were holding the Mayor and other elected officials accountable for what they do to improve student learning ... voters and leaders need to do their own homework to know more about the poverty gap, and why it is a critical issue that affects all of us, not just the poor." So with that said, my intention today is NOT to endorse a particular candidate. Instead it is to share the links to the education surveys I just read, so you too can take a look at each candidate's proposed plan - in their own words. So we can do our homework. I've listed the candidates in alphabetical order, and highlighted moments in the surveys that I feel might relate on some level to tutoring/mentoring (the theme to my maps). Oh and of course, I've added a few maps. 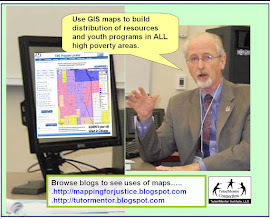 Click on these to see how maps make elected leaders more effective! * Read her full survey here. * Read a recent MFJ article that features Braun here. Braun reminds us of her support as Senator for "Midnight Basketball programs, which brought local youth together with local police officers." This is as close as she gets to discussing tutoring/mentoring programs. Much of her plan focuses on what she believes needs to happen in the schools. For instance, she calls for an expanded curriculum that includes courses students find attractive, to can keep them from dropping out. She also wants to add vocational training to the curriculum, to "provide students with the skills to be more competitive in the workforce and less likely to join gangs." It makes sense that the majority of a candidate's policy would be focused on the schools. After all that's where the students get the bulk of their academic and social training. However, I wonder if these candidates have looked into using non-school mentoring programs that could give a boost to their efforts to keep students in school, on a path toward the workforce, and away from gangs. Braun does suggest that her administration "will coordinate social services to meet such needs that transcend teachers' ability to resolve, such as homelessness, hunger, poverty and traumatic home environments," so maybe the connection will eventually happen. * Read his full survey here. * Read a recent MFJ article that features Chico here. Chico regrets that the afterschool programs he accomplished as President of the Board of Education "have been scaled back and in some cases, eliminated." These programs "gave nearly 200,000 CPS students alternative and constructive things to do." Indeed, the city budget is a mess, so I hope when he suggests that "by partnering with community organizations ... we can leverage resources to reduce costs," he's aware that there is an existing network of tutor/mentor programs Tutor/Mentor Connection (T/MC) has in their directory that are also currently giving CPS students "constructive things to do." A former CPS student, with a community organizing background, Del Valle says, "I am inspired by efforts where neighbors, churches, and other partners work together to ensure the safety of our children. I will encourage and support all such programs in conjunction with parents and neighbors [and] non-profit organizations..."
Del Valle has strong ideas about how to "provide youth with [at-school] opportunities to engage in positive activities and contribute to community life through after school programming." In fact, he seems to provide the most detail in his survey, regarding specific education policy goals, proposed programs, and developed ideas about where the money will come from (taxes, TIF funds, and private sector alliances included). He also seems, looking at the surveys, to have the best-developed plans for what to do with kids in non-school situations, proposing "an expanded program called 'Community Learning Centers' to create extended day learning opportunities that may include technology clubs, the arts, sports, tutoring, and specialized programs for students. This would be done by creating partnerships among the private sector, nonprofit organizations, and schools." Del Valle echoes the hopes of the tutor/mentor community when he states that, "it is imperative to promote and help bring to scale programs that intervene and bring corrective action to get youth back on a productive path rather than simply emphasizing punitive measures that lead down a path to nowhere." Much of Emanuel's platform seems to focus on programs that will happen at the school. He "calls for comprehensive after-school programs ... integrating child intervention programs across departments." He calls this win-win for the students, citing after-school programs' abilities to "both increase academic progress and reduce violence. He seeks funding through "school partnerships with local businesses and non-profit organizations that want to target specific schools." Perhaps he too is aware of the existing network of non-profit tutor/mentor programs available to partner with the city and support student development when the students are away from school. T/MC can even map which resources are available near the "specific schools" he wants to target. After all, Emanuel does want to "incent community based organizations, citywide non-profits, universities, commercial companies and other civic institutions to bring their people and programs to bear to support particular struggling schools by providing mentors, tutors, job training, access to college courses, and in classroom support to schools that need it most." 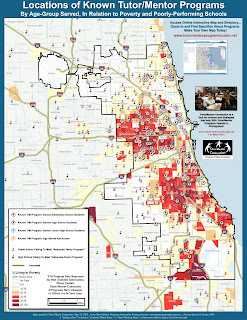 On a personal note (as map geek), I'm fascinated by Walls' interest in "increasing the use of Crime mapping and data analysis" to help combat crime in high poverty neighborhoods. But staying on topic, and looking for indications that Walls intends to incorporate tutoring/mentoring into his plans to support for at-risk students, Walls does say that he "will provide tutoring, social skill development and increased recreational activities in an effort to achieve normal educational accomplishments in chronically low-performing schools." He does not go into great detail about how this will happen, yet I am hopeful he supports existing programs in his community - he does offer some genuine opinions and somewhat creative/alternative solutions to problems his community faces. An alumnus of Fenger High School with an intimate understanding of the challenges and hazards at-risk students like Fenger's Derrion Albert face, Watkins outlines her ideas for school leadership, curriculum, quality schools, and teacher mentoring. Particular to student tutoring/mentoring, she wants to "champion for early child education" and promises to "remove barriers families experience in accessing existing early childhood education programs and services." She also touches briefly on "peer-to-peer mentoring programs that are developed with and supported by youth" but does not mention partnerships with existing adult-student tutor/mentor programs specifically. Remember! Polls open at 6am this Tuesday, February 22! Find your polling place and other information about the election here. And let's make sure whoever wins keeps their promises, and explores all resources available to improve the health of our schools and the prospects for our students. Over the past 15 years I've reached out to Mr. Chico often and to Mr. Walls often with no evidence of either person taking a serious look at what the T/MC was offering. I tried to reach out to the Emanuel campaign last fall and received no response. If any of the candidates were to do a Google search for "tutor mentor" they would find our web sites on the first page and be able to use them to do research and expand their thinking on what they and other leaders need to do to support the growth of high quality volunteer-based tutor/mentor programs. Our information may be extensive and difficult to navigate but if someone wants to be leader of the 3rd largest city in the country, they should be able to find someone who will spend the time learning how they can use this information. None of these candidates come from a business/marketing background, where the goal is to expand market share by putting more stores where there are potential customers, and selling more products and services at those stores. If they did maybe they would see a tutor/mentor program as a "store" where hope, opportunity, mentoring and extended learning are available to inner city kids, and where experiences and learning are also available to the volunteers from beyond poverty who become tutors/mentors. Tutor/Mentor stores are meeting places and connecting points that can help bridge the divides that separate us in this region. I'm preaching to the choir when I tell this to Mike because he works with me at Tutor/Mentor Connection. I hope that we reach some of his readers and some of tomorrow's voters.